With Lisa away, I need to fill some blogging space so I thought I would complain about our garden. As I suffer through the horrible sunny high 20s/low 30s weather, she gets to enjoy the last throes of ‘superstorm’ Sandy bringing wet and snow and cold to the eastern half of North America. Oops, sorry, I guess that I should have said that the other way around: as I cycle, garden, and dine on the patio in the Wagga spring that is more pleasant than an Edmonton summer, she suffers through an unseasonably cold Ontario autumn. But look at it this way, it is probably more pleasant than your next trip there in January will be (when I hopefully get to see Elvis Costello play on a summery winery lawn…). I wasn’t gardening at night, just out taking horrible photos with my phone. 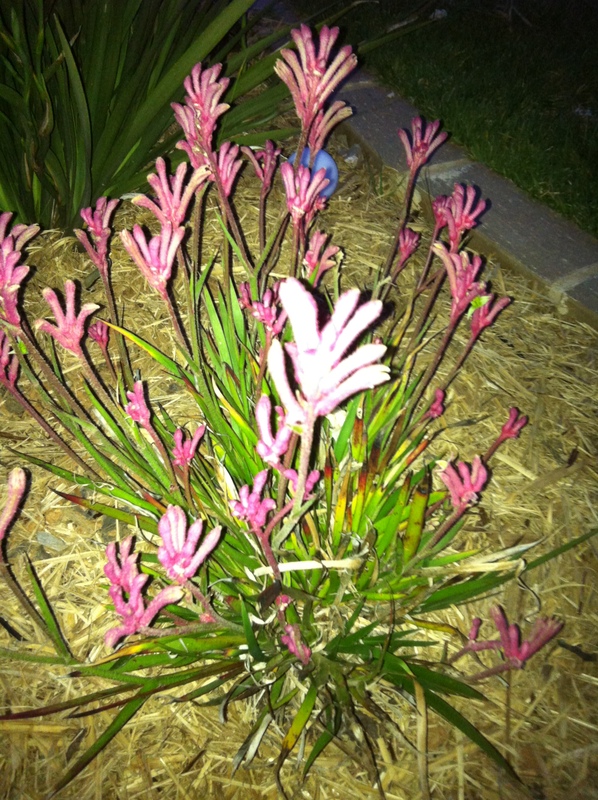 This kangaroo paw, that lived in a pot at our old house, is thriving now that it is in the ground. So anyway, back to the point, as I sat on the back patio this evening, enjoying the weather, looking out at our garden (yard in North American terminology…though I prefer this quaint British term), I realised how much I hate it (the garden, not the weather). Well, not hate, just am ‘not satisfied’ with it. Unfortunately the landscaping basics were done before we bought the house, maybe even a notch beyond the basics…there is a good structure with nice rockery. But there is a whole lot of really horrible grass that needs to go. At times, given our lifestyle, I think it would have been better to move into a completely blank dirt-coloured canvas (as we did in our house in Edmonton) because that would have given us inspiration to do something quickly. There, we created a really nice space because otherwise it meant living with mud. Here, with the basics already done, it is livable so there is less incentive to replace (very) boring and (very) ugly, but (barely) functional space when we could be paying off the mortgage instead (note to property developers: not all of your potential customers have children, so when you build spec homes, think about people like us – high income, no children professionals who don’t need room for a jumpy castle or a pool). Because what we have is pretty dismal and needs work. 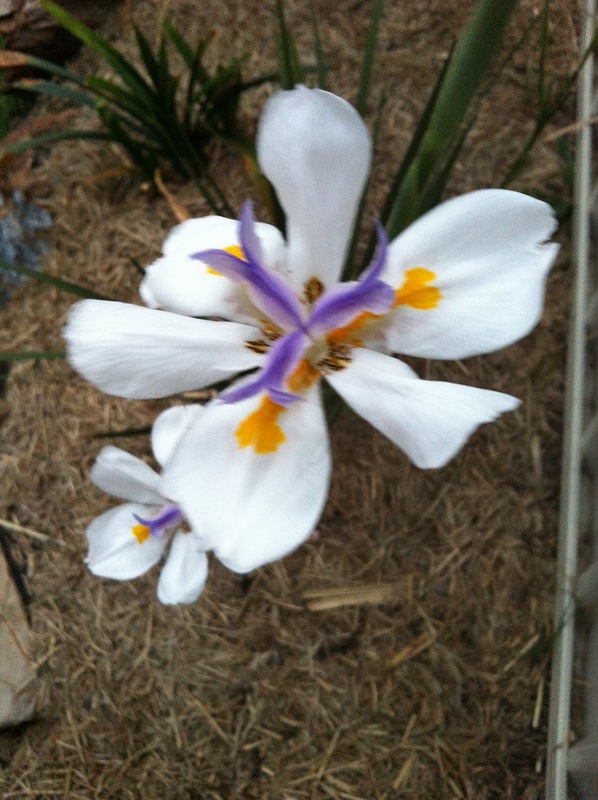 This Australian white iris is the kind of thing we want more of. They require almost no work. time – not time in that we don’t have time to work on it, but more that in the time we have been here we don’t know what we can do, what grows, what we want, etc. knowledge – we have no idea how to garden here. We learned a bit in the rental house but not much. And that soil was very different, and the sun was different, and…we don’t have a clue what we want to do. What we do know we have a large block (lot in North America…and large by North American city standards, here…not so much) of grass that we don’t need or want. We could play cricket on it if it were flat and level. But we know nothing about cricket, so what we want is a low maintenance, low water, native garden. Things that flower. Things that look nice. Things that attracts birds. And some veggies…not necessarily native, because we don’t know what that might entail, but a good size salad garden that we can enjoy in the warm months. Sort of like what we had in Edmonton, except here things will actually have time to grow. There we planted things and watched try to grow before they froze. Here, They will thrive. 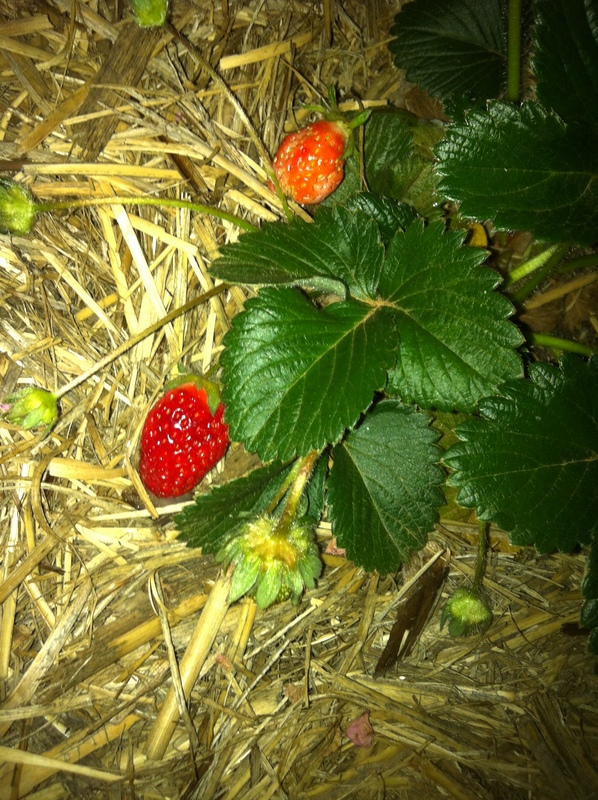 The strawberry plants don’t do well where I put them, but there is hope yet! And though not every meal since Lisa has involved a salad from the greens we planted, most have. Or if not, made good use of the herb garden (Note to Lisa: you aren’t going to recognize it when you get home…you might not even be able to see over the cilantro trees. And I think I have finally got the basil problem solved…). Our tomatoes are doing well, I ate a blueberry off our little bushes, and there are squash that will be ready to eat soon. So yeah, gardening in Australia, in case you haven’t figured it out, is different from gardening in Canada (haven’t mentioned the citrus trees, have I?). Just have to figure out how to do it properly, with less grass and more flowers and food. 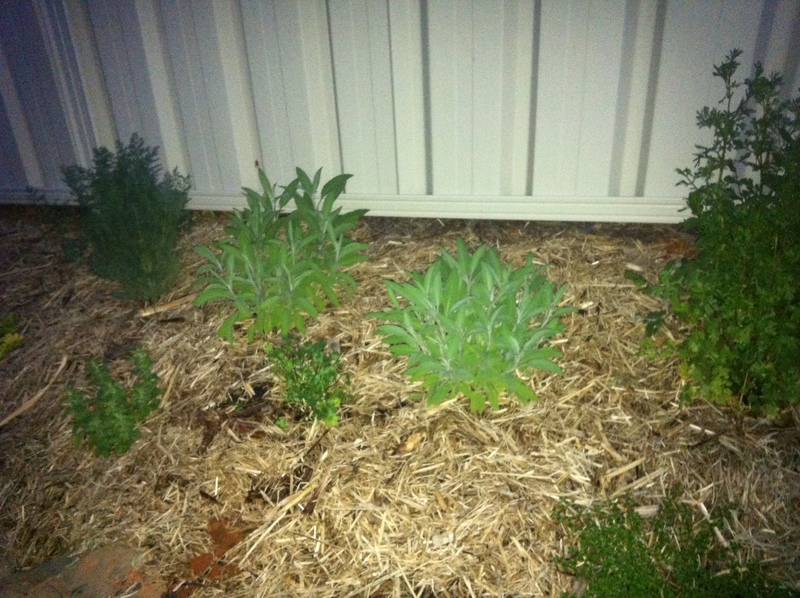 This entry was posted in citrus, Edmonton, gardening, house, strawberries, wagga, weather. Bookmark the permalink.